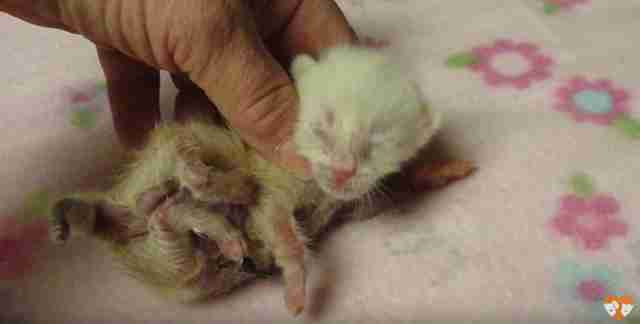 When three tiny kittens were brought to a shelter in Los Angeles, It was clear that they'd been born only hours before - and that they'd been abandoned because they were different. 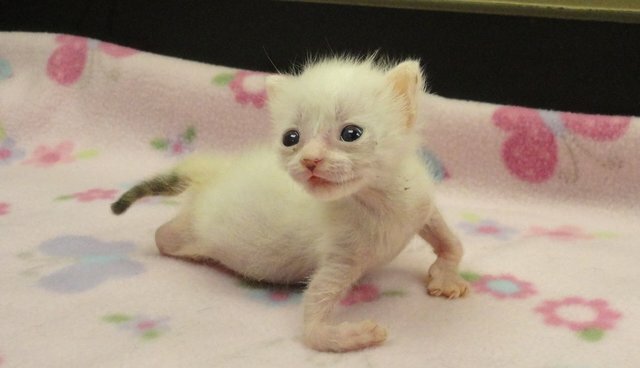 Pretzel and her two siblings, Oliver Twist and Curly Sue, were born with twisted arms and legs, making them look and move differently than most kittens. 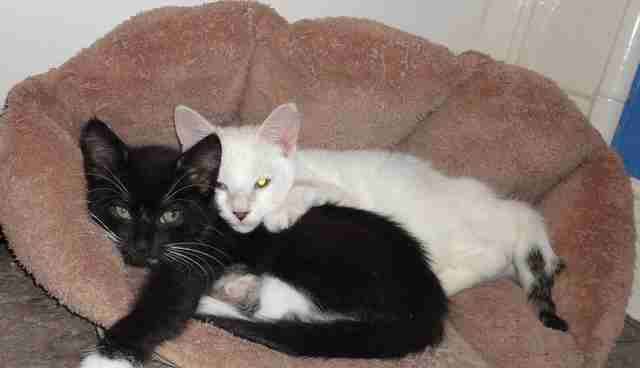 Kitten Rescue, a group in Los Angeles, took on the kittens and gave them to Laura Hawthorne to foster. "It was a bit of a rollercoaster ride," Hawthorne told The Dodo. 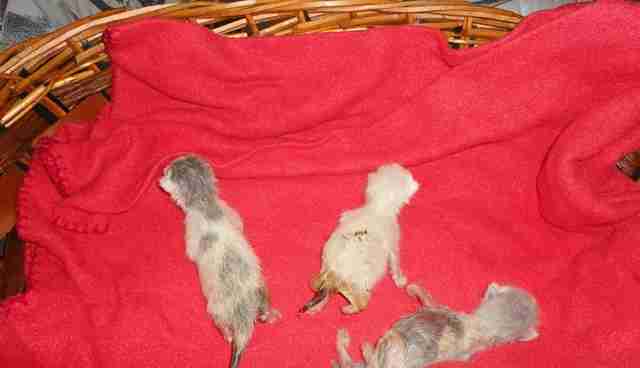 "When I picked them up from the shelter and they were just hours old and I saw the extent of their deformities, it was a little overwhelming." Unfortunately, Oliver Twist didn't make it through the first night, and Curly Sue passed away after 14 weeks. Pretzel, however, never stopped fighting. Pretzel has many medical issues, including a heart murmur, abnormal skeletal development, missing bones in her legs, abnormal pelvic development and an underbite. She couldn't care less about all that. "I really don't think Pretzel realizes she's handicapped," Hawthorne said. "She developed her own way of scooting around and managed to get to wherever she wanted to go." Losing her sister, Curly Sue, was definitely hard on Pretzel, but she overcame her grief. "Initially she was confused and looking for Curly Sue, but we all made a point of spending a lot of time with her," Hawthorne said. " At my house there's never a shortage of foster kittens coming and going, so she had many close friendships during her time with me." Due to Pretzel's health issues, Hawthorne assumed she would be a "forever foster" - but one day, she got an email that changed everything. Michelle Harrison saw a video of Pretzel posted online, and instantly fell in love. "She had been moved to tears while watching the video and decided then and there that she would be Pretzel's forever mom," Hawthorne said. A meeting was arranged between the pair, and it was love at first sight. Despite all the odds, Pretzel had survived, thrived and found herself a forever family. At 8 months old, Pretzel was finally adopted. "It was very hard to part with her, but I knew she was going to a home where she would be adored, incredibly cared for and spoiled rotten," Hawthrone said. Harrison had never planned on adopting a special needs cat, but after discovering Pretzel, she knew it was meant to be. Pretzel was extremely shy and timid when she first moved to her new home - which just made Harrison even more determined to make Pretzel feel safe and loved. Soon enough, she absolutely achieved that goal. "She's the biggest lover. 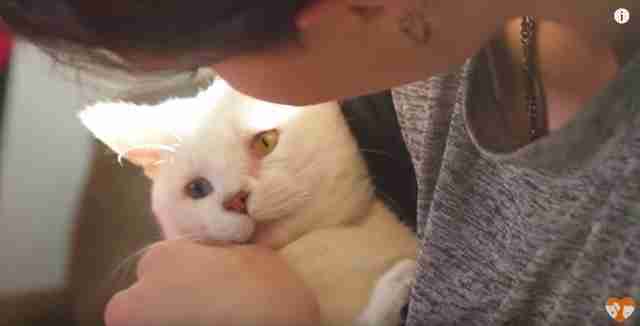 She's so sweet and affectionate," Harrison said in a video about Pretzel's journey. To help Pretzel get a wheelchair so she can move around easier, check out her GoFundMe page. 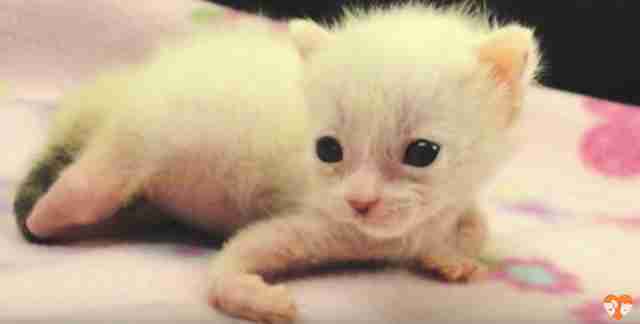 If you'd like to help other kittens like Pretzel, you can donate to Kitten Rescue through its donation page.